Two QLD siblings facing deportation this Christmas. Sunday's news in under 5 minutes. 1. Two Queensland siblings face deportation three days before Christmas. 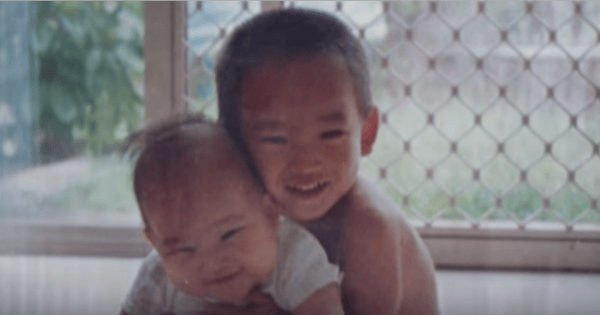 20-year-old, Phillip Choi and his sister, Amy, 18, are facing deportation on the 22nd of December after Immigration Minister, Peter Dutton, has refused to grant them permanent residency. Phillip has lived in Australia for over 13 years, whilst Amy was born in Queensland, their family returning to South Korea between 1998-2005. 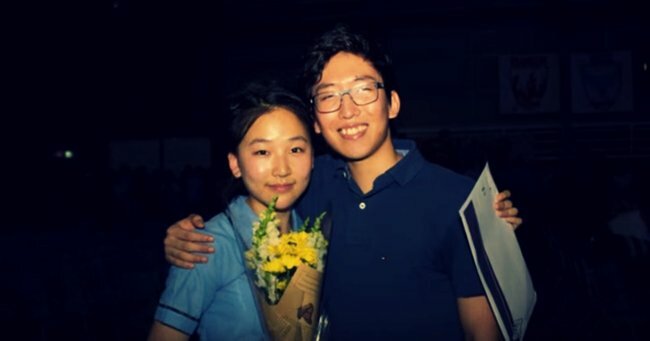 Both siblings, who call the Gold Coast home, received OP 1s and are regular volunteers in the community and non-for-profits, with Phillip being the captain of his high school and receiving an academic scholarship to study at the University of Queensland. Phillip and Amy as children. Image via Youtube. In 2013, their family were assessed by then Minister, Brendan O’Connor, for a permanent residency in Australia, which was subject to health and character assessments. It has been only in the past months that their application for a permanent visa has been denied by the Immigration department, and instead granted 6 month visitor visas that expire this Tuesday. Phillip has told Mamamia that whilst his family are able to stay in the country on these visas, their options are so strictly limited. “[A]lthough it [the visa] provides us with the opportunity to apply for further stay, our options are gloomy,” Phillip said, “Another visitor visa will put us into further limbo for few months, unable to work. The student visa is not an option due to the high fees. The implications of the visitor visa are nothing short of deportation. In an interview with The Courier Mail, Phillip of the horrific implications if the deportation were to proceed. The Change Petition has now garnered almost 7,000 signatures, with an online media campaign desperately seeking for the Minister to change his decision. If you would like to help Phillip and Amy, please sign the petition here. 2. Policeman called to the fatal crash of his own daughter. 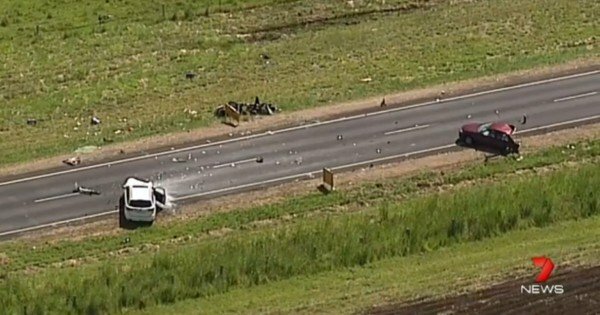 A two-car crash on the Bruxner Highway in NSW, has killed one four-year-old girl at the scene, and another left in a critical condition in Brisbane’s Lady Cilento Hospital. Richmond police sergeant, Steve Underhill, was called to the scene on Friday to find that the those involved in the crash were his two daugthers, and their babysitter. The two young sisters were passengers in the vehicle that their 18-year-old babysitter was driving, who had just finished high school. The crash scene. Image via 7 News. A witness at the scene told media that the car appeared to be ripped in half. “We were driving and heard a big bang and smoke,” said the witness, “So we got out of the car to see what had happened. One half of the car was on the right side of the and the other half on the other side. The witness also described the moment the sister’s father arrived, leaving him “speechless” and the babysitter was left emotionally ruined after the event. The cause of the crash is being investigated by the Police and a report will be prepared for the coroner. 3. 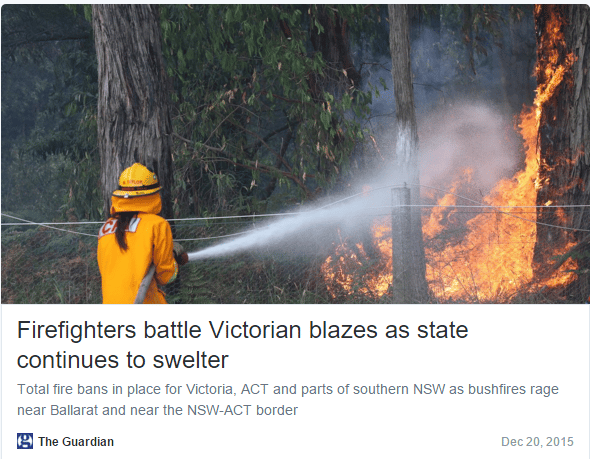 Victorian bushfire threat continues overnight. Authorities are warning that extreme fire conditions will continue across the state, as hot and windy conditions are predicted for the day. The Country Fire Authority has confirmed that properties have been lost in the fires across Victoria, however, the extent of the damage can’t yet been confirmed. Over 300 new fires broke out yesterday, the most significant being in the Scotsburn area where hot winds spread the blaze to around 3,900 hectares, according to the ABC. A spokesperson for the CFA has attributed the unpredictability of the fires to the windy conditions. Over the next few days, temperatures are expected to rise to 39 degrees Celsius in Melbourne, Mildura and Bendio, while in Sale they will reach 42. People are urged to abide by the total fire ban across the state and do all to ensure their safety during this time. 4. Commissioner warns against “mermaid tails” as a Christmas gift. 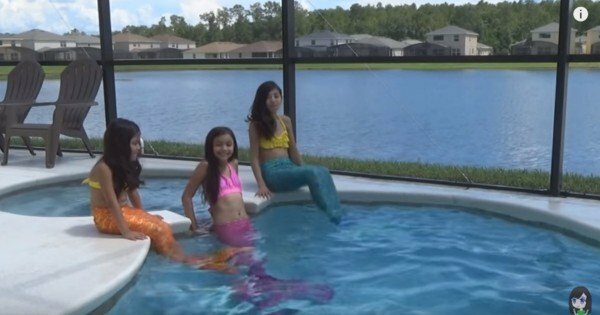 The NSW Fair Trading Commissioner, Rod Stowe, has warned all parents about the potential dangers of a popular new gift, the “mermaid tail”. Despite no injuries yet reported from the item, a spokesperson for the Commissioner said that the caution against it was pre-emptive, following a video released in the where a young girl wearing the tail is seen to get stuck upside down. Supporting the Commissioner’s warning is consumer group, CHOICE, who reiterated the potential risk the mermaid tails present. Whilst the toy is not available in stores such as Toys R Us, Big W and Target, according the Sydney Morning Herald, they can be easily purchased online. The price range of the gift is between $20 to $700. Mermaid tails have not been banned in Australia, but the Commissioner urges parents to abide to the age recommendation of six-plus, the children be good swimmers, and be supervised at all time by parents or guardians. 5. Outrage after “Australian Aboriginal Lucky Dolls” being sold at Brisbane Airport. 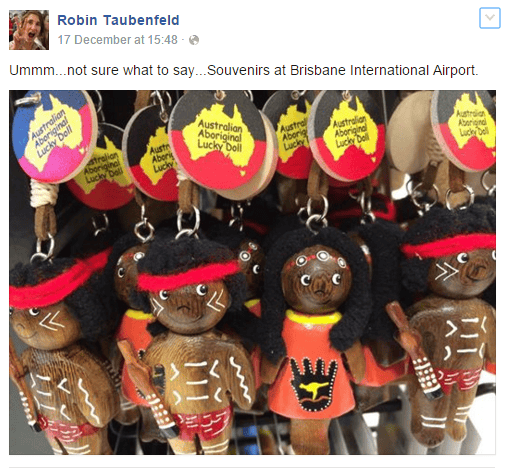 The sale of “Australian Aboriginal Lucky Dolls” has sparked outrage about cultural appropriation after a woman found them in a souvenir shop at the Brisbane International Airport. The original post on Facebook. The shop where the dolls were stocked, Australian Way Pty Ltd, has been quick to pull the dolls from shelves around Australia. 6. Petition to appeal the Baden-Clay decision closes at 122,000 signatures. An online petition demanding Queensland’s Attorney-General to appeal the downgrade of Gerard Baden-Clay’s from murder to manslaughter has closed with 122,000 signatures. 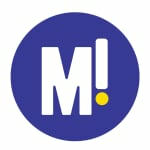 The petition was first launched on change.org by Nicole Morris, from the Australian Missing Persons Register, to give Australian people a voice if they believed the decision was wrong. 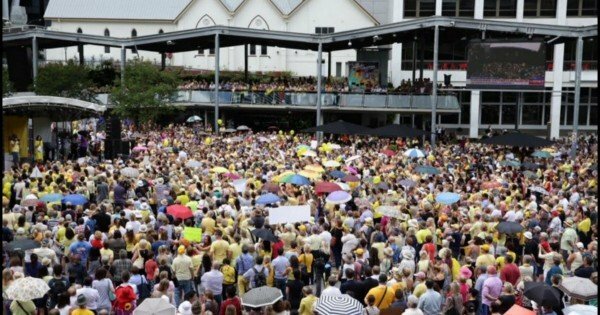 A rally for Allison Baden-Clay on Friday. “The idea was really to give Australia a voice and to allow people who had the opinion that the decision was wrong to say, yes, I think the decision that was handed down was wrong and I want to sign my name to that,” Morris told the Courier Mail. Morris has printed out over 3200 pages of signatures, to show the physical weight of the public opinion, and will present the petition to the Attorney-General, Yvette D’Ath soon.